Are Superfoods Really Good for You? 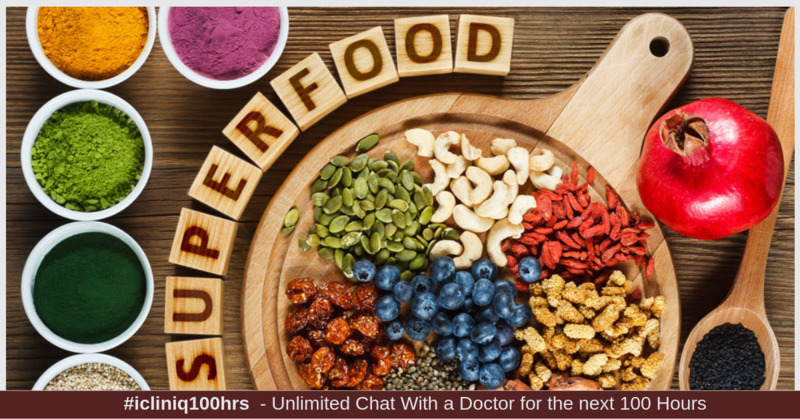 iCliniq › Ask a doctor online › Health Articles › High Fibre Diet › Why Should You Consume Superfoods? Blueberries are called the 'king of antioxidants'. This title is indeed very apt owing to the vitamins and minerals present in blueberries. Blueberries contain a group of compounds called as anthocyanins which have numerous benefits like prevention of cardiovascular disease, diabetes, and stroke. They help prevent iron deficiency as blueberries contain vitamin C which enhances the absorption of iron. They almost meet the 24 percent requirement of vitamin C as per the recommended dietary allowance intake. So, do consume blueberries. You can mix them with yogurt which is a lovely source of probiotic that will cleanse your gut, cure bloating, and destroy harmful bacteria in your gut. Turmeric is really beneficial as they contain compounds called as curcuminoids and specifically curcumin which are anti-inflammatory in nature and helps combat free radical scavenging, thus preventing various metabolic syndrome disorders. You can add turmeric in milk and consume it at night as they have magical properties to prevent and cure cold and fever. Amla, a tiny fruit loved by many, fulfills the need of our daily requirement of 65 to 90 milligrams of vitamin C just by consuming one tiny amla. It even competes with the huge watermelon in terms of its vitamin C content. Also, it is loaded with other nutrients like B complex vitamins, selenium, and magnesium. Do you know the secret of a long and strong hair? Just protein? Along with it, Amla has tremendous effects for long and strong hair just like you would see in shampoo advertisements. Flaxseeds, a wonderful superfood filled with fiber aids weight loss. It also destroys symptoms of iron deficiency anemia and pernicious anemia. You can have it plain or roasted. Sprinkle it on cut fruits to enhance the absorption of iron. You can even have it half an hour prior to or after your main meal for amazing benefits as just a tablespoon of flaxseeds provides 7 grams of fiber. Make chia seeds your best friend as it is loaded with ample amounts of protein, fiber and also it is low in calories which will aid weight loss. They are rich in omega-3 fatty acids which will promote good heart health. You can mix it with flaxseeds and consume it along with cut fruits. It helps raise the good fat levels (high density lipoprotein) which remove cholesterol from the arteries and gives it to bile through digestion thus lowering your blood pressure and preventing a stroke. Oats are a source of beta glucan and rich in soluble fiber which helps eradicate fatty streaks built up in the heart and thus prevent atherosclerosis. The best way to consume it is by making an oats smoothie by adding chia seeds and flaxseeds in it, a favorite fruit of your choice and some yogurt which is an essential probiotic. You can even have oats porridge in the morning which will lower the glycemic index and keep you energetic throughout the day. We all have heard since childhood that almonds and walnuts boost brain development. It is absolutely true. Almonds are a source of good fats which will raise your high density lipoprotein and decrease your bad cholesterol levels (very low density lipoprotein). According to various research studies, almonds and walnuts are known to slow down the aging of the brain cells. Thus, they are very essential to develop one's cognitive development. You can soak it or just consume six almonds during your mid meals or in the evening. Even when you are just too busy at work, you can consume them. Roasted horse gram is another healthy choice. Hope you loved reading the article on seven superfoods that can save your life. Do you have a question on High Fibre Diet or Antioxidant?